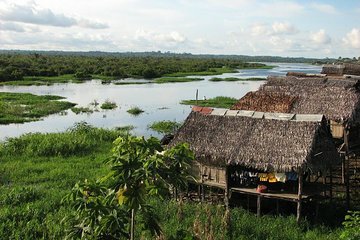 Undslippe byen for at genskabe dig selv med naturen på et 3-dages Amamzon jungle eventyr fra Iquitos, designet til at glæde naturens elskere. Udover at inkludere eco lodge indkvartering, vælg måltider og alle aktiviteter, udflugten funktioner jungle vandreture, nat ture, svømning med vilde lyserøde delfiner, og en bådtur på Amazonas floden. Hotel afhentning og drop-off i Iquitos er inkluderet. We didn't get to see the 'mirror lake' as it had rained but our guide was able to make a switch with other activities. The lodge was great and we were able to fish some piranhas, too! The night tour was great! Our guide managed to grab a small crocodile for us to see up close and then put back again in the river. On the Amazon river tour, we managed to see lots of dolphins too! We were able to see a sloth up close and a howler monkey too.